https://scottsdale.bintheredumpthatusa.com/home/e	Bin There Dump That Scottsdale	https://scottsdale.bintheredumpthatusa.com/img/franchisees/43.jpg	48 W. Foothill Dr, Phoenix, AZ	Contact us for more details. We are dedicated to managing and disposing of our client’s trash in Scottsdale in a responsible and professional manner. Are you moving in the Scottsdale region and need to get rid of some junk? Maybe you have a pile of rubbish around your home or office. Or maybe you have a lot of junk from your renovation project or construction clean up. Bin There Dump That provides junk and rubbish removal bins sizes 4 to 20 yards. No matter how much or how little junk or rubbish you have to get rid of, we have a bin or dumpster for you. 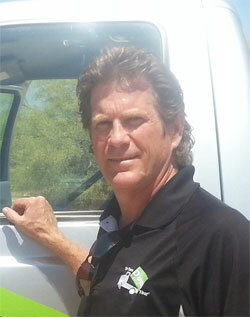 Your local Scottsdale dumpster rental operator is Les Englund. Scottsdale, Arizona - Phoenix, Scottsdale, Glendale, and Cave Creek. Easy to book a dumpster rental on the phone. The people at Bin There Dump That were prompt and had very friendly service from phone to driver, a great deal over all. I would highly recommend this company, and will most definitely use them again when opportunity knocks! Thank you again for everything! I needed a dumpster for a shed and barn clean out. We were surprised with how much our bill was and were informed that it was due to going over the weight limit. This is our first time renting a dumpster, they never informed us of extra charges for going over. I needed a 20 yard dumpster for a house renovation project. I was removing drywall, wood and other materials. I've used them a few times since and am satisfied with the service I receive from Bin There Dump That. We had a challenging move out of our house of 20 years and needed a large dumpster. Les and his crew were so easy to work with. The dumpster was clean, arrived on time (actually 1 hour early which was even better! ), layed it perfectly where we wanted it. We were overseas when we emailed him to pick it up and it was collected that day. We liked the walk in loading aspect. It works great until it starts to fill up , then you convert to tossing over the side. 5 star rating! I just bought a furnished house and am slowly getting rid of some old stuff like couches, cabinets, and other home belongings. BTDT was, in my opinion, exceptionally fantastic. I asked for a 10 yard dumpster for a week-long rental. They came early, were very professional, and brought stuff to protect the driveway. The guy was very courteous. I couldn't ask for better service. A was worried that picking a bin rental would be a difficult process, but I was pleasantly surprised with the selection offered when selecting my bin rental. I couldn't be more pleased. The dumpster was clean and delivered on time. Les and Chris provided exceptional, professional, and quality service. They even cleaned up after themselves! We were working on a remodeling job and a closet addition for a customer and had some construction debris to get rid of. We rented out a 10-yard dumpster from BTDT for 35 days. The unit was just small, but really clean. They came on time and were easy to work with. They were an excellent company. We were really happy and are planning on doing repeat business with them. They really know how to make a dirty business look clean! When they arrived, I was amazed at how clean the bin and the truck was. When I spoke to the delivery guy, he explained the process and was super friendly. Way to make a first impression, I would definitely use them again!